The Duke and Duchess of Cambridge and Prince Harry hosted President Obama and the First Lady for dinner at Kensington Palace. The royals greeted the Obamas inside Clock Court. They chatted outside for a moment despite the dismal weather. 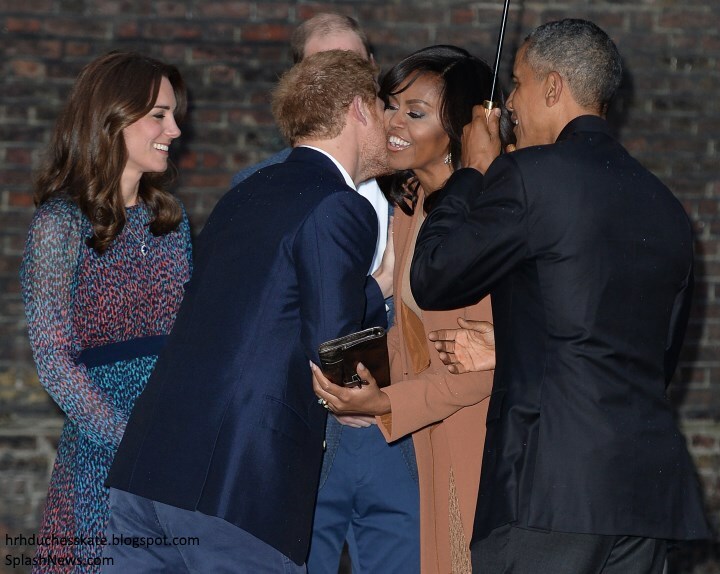 Prince Harry greeted the First Lady with a kiss on each cheek. It's a significant night for the young royals - marking the first time they have hosted a head of state without other senior royals present. This type of role will form an important part of their duties in the years ahead. It's also the first official function held at William and Kate's recently renovated Apartment 1A. Ahead of the dinner, Kensington Palace said: "Their Royal Highnesses are very much looking forward to welcoming President and Mrs Obama." William, Kate and Harry have forged a warm relationship with the Obamas in recent years. The Duke and Duchess met the couple at Buckingham Palace shortly after their wedding in 2011. Kate met Michelle again at the Olympic Opening Ceremony reception in 2012. William met the President in the Oval Office in 2014 when the pair discussed children, with William revealing he was so excited when George was born he forgot to ask the gender. Harry has worked with Michelle in particular, through support of military personnel and work with the Invictus Games. They posed for a photo outside the front door of William and Kate's Apartment 1A. Omid Mio Scobie shared a photo of the entrance to 1A. As Mr Obama approaches the end of his second term in office, it seems rather fitting for the royals to host them during what is expected to be his final official trip to the UK as president. A White House spokesman said: "The visit will allow the president to offer his gratitude to the British government and people for their stalwart partnership with his administration and the American people throughout his presidency." William, Kate and Harry led the the President and the First Lady to the Drawing Room before dinner. 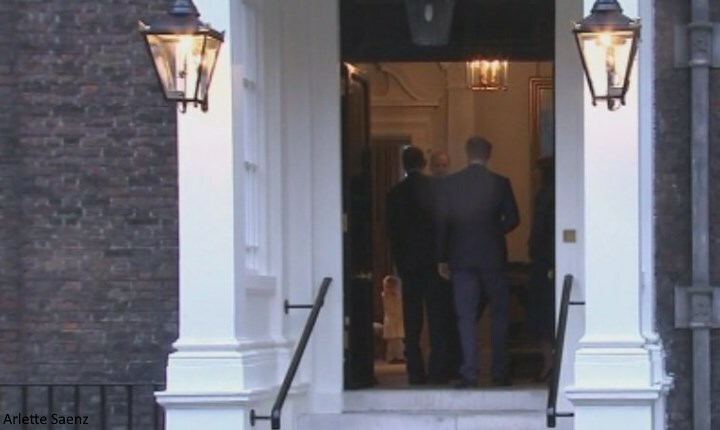 Prince George was eager to meet the guests and was seen standing in the hallway waiting for the Obamas. The Prince was allowed to stay up late to meet the couple who were absolutely thrilled to spend time with him. Princess Charlotte was sleeping soundly. Indeed, President Obama is the first of many presidents George will shake hands with throughout his life. This photo is unbelievably adorable - it's a real treat to see the William and Kate with George in their own home - and how cute is he in those pyjamas? A closer look at the mother-son moment. .The Duchess and The First Lady chatting. 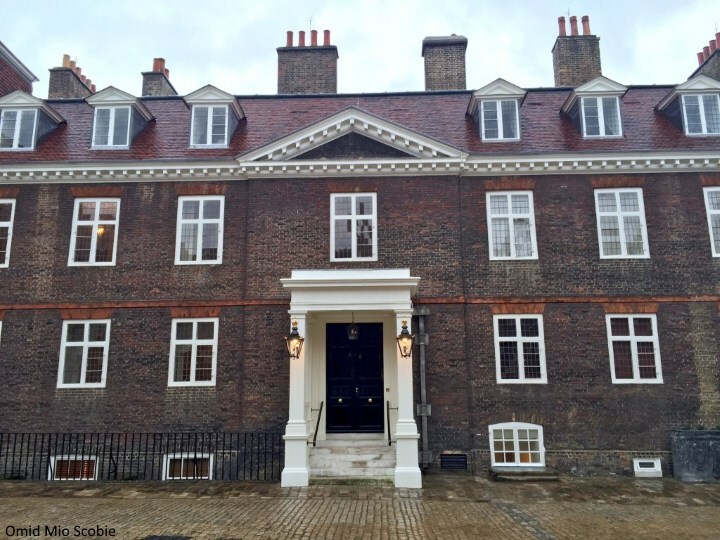 It is incredibly interesting to see William and Kate's home. The interior decor is very tasteful and elegant. There's a wonderful selection of family photographs and flowers. 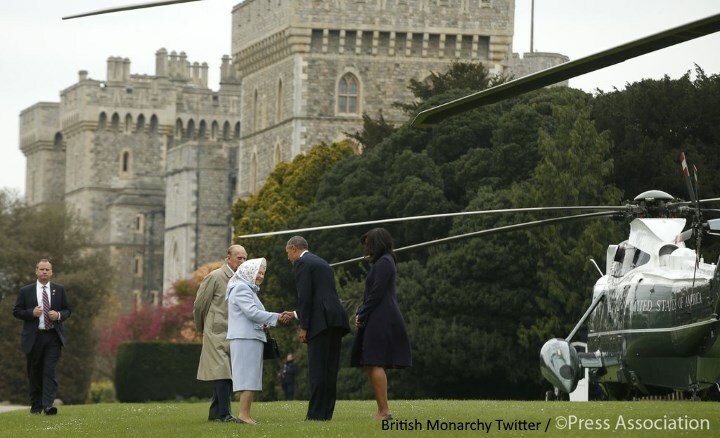 Earlier today, the Obama's had luncheon with the Queen and Prince Philip at Windsor. During a press conference afterwards he described the monarch as "a real jewel to the world" and "one of my favourite people". 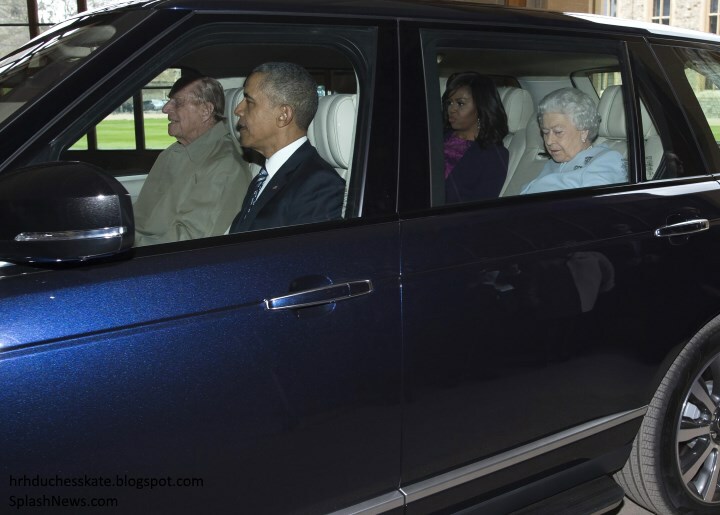 Much to the surprise of secret service agents Prince Philip decided to drive the couple to the entrance. Mr Obama said: "I have to say I have never been driven by a Duke of Edinburgh before, and I can report it was very smooth riding." What does one give the Queen for her 90th birthday? The Obamas gave Her Majesty a photo album of her visits with US presidents and First Ladies. Her Majesty has met twelve presidents during her lifetime; it's a topic we covered in-depth over at The Royal Digest a couple of years ago. The Queen wore a pale blue skirt skirt, while Mrs Obama chose a dress by one her favourite designers, Oscar de la Renta. Back to tonight, the Duchess chose the L.K. Bennett 'Addison' dress for the dinner. 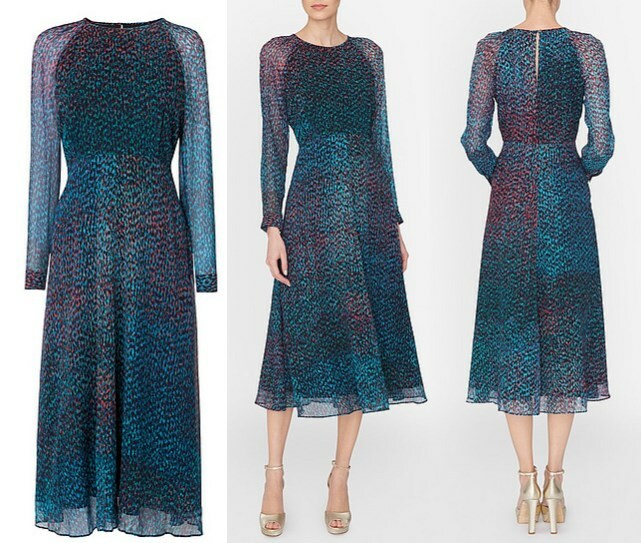 The £325 dress features a jewel-toned print, transparent sleeves and ankle-grazing length. It's described as: "Ideal for events both formal and casual, timeless in its style and fashion forward in its execution." It's available in very limited sizing on the UK and US websites. Upon seeing the first image from this evening, I thought the dress had a very familiar feel to it; the Addison bears similarities to the L.K. 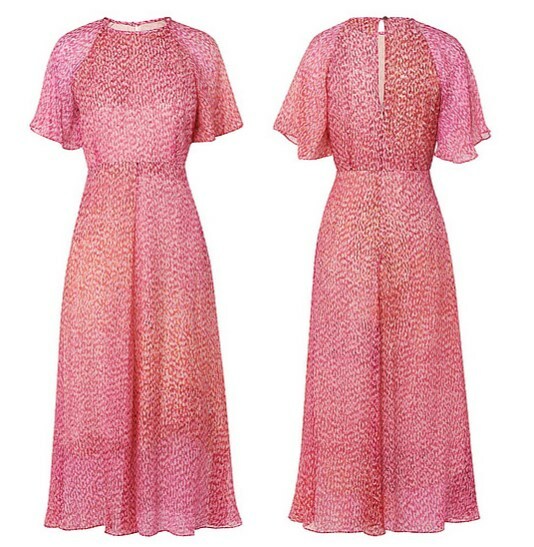 Bennett 'Madison' dress Kate wore for a private dinner at Berry Bros & Rudd last August. Coincidentally L.K. Bennett just released the Madison dress in a feminine pink print. It's a beautiful, flowing dress. Kate added her own navy belt. Several eagle-eyed readers noted it appears to be the same belt she wore with her Glamorous Maxi Dress in India. 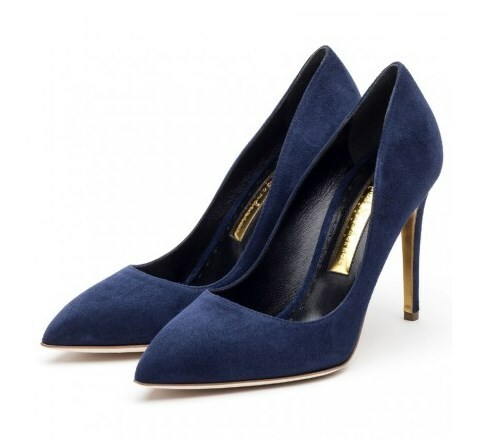 The Duchess teamed the dress with her navy suede Rupert Sanderson Malory Pumps. 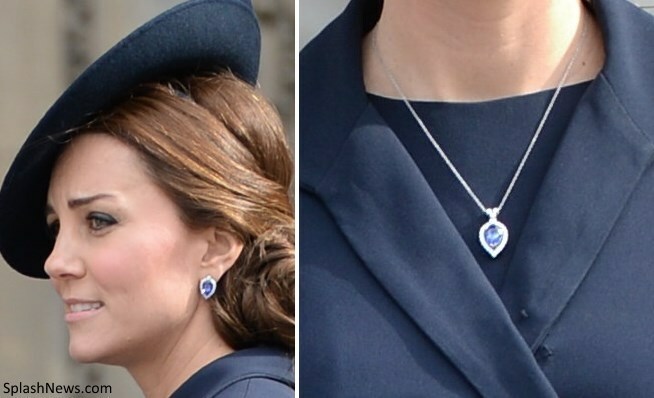 The amazing Anna instantly recognised Kate's jewellery as the G. Collins & Sons tanzanite and diamond earrings and pendant. Kate wore the earrings and pendant for for a service of commemoration to mark the end of combat operations in Afghanistan at St Paul's Cathedral, London in March last year. 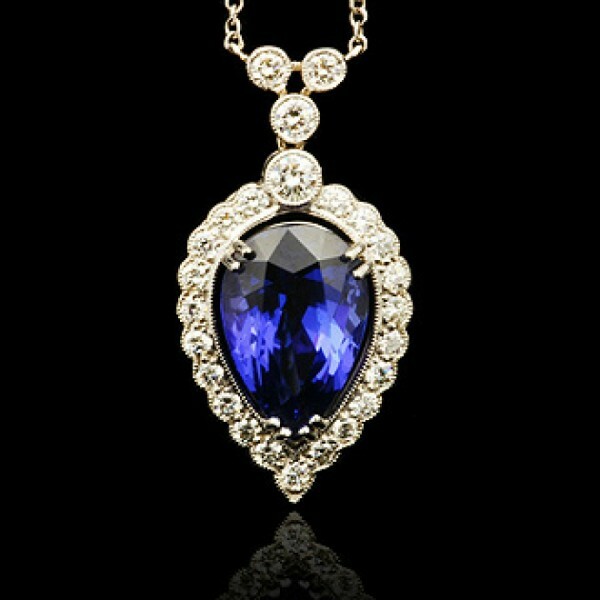 Below we see the Tanzanite and Diamond Pendant at G. Collins & Sons. The pear shaped pendant retailed for £8,400. Moving on to George's adorable personalised bathrobe. Trisha and Anna identified it as the Personalised Cotton Robe by My 1st Years. The robe comes in an array of colours and is available to pre-order for £27 here. George also wore the Little Boston Plane Slippers from Trotters. There's an arrival video available on YouTube. Also today, Prince William carried out investitures at Buckingham Palace. He gave an MBE to Julia Samuel, a dear friend of the late Princess Diana's and Prince George's godmother. 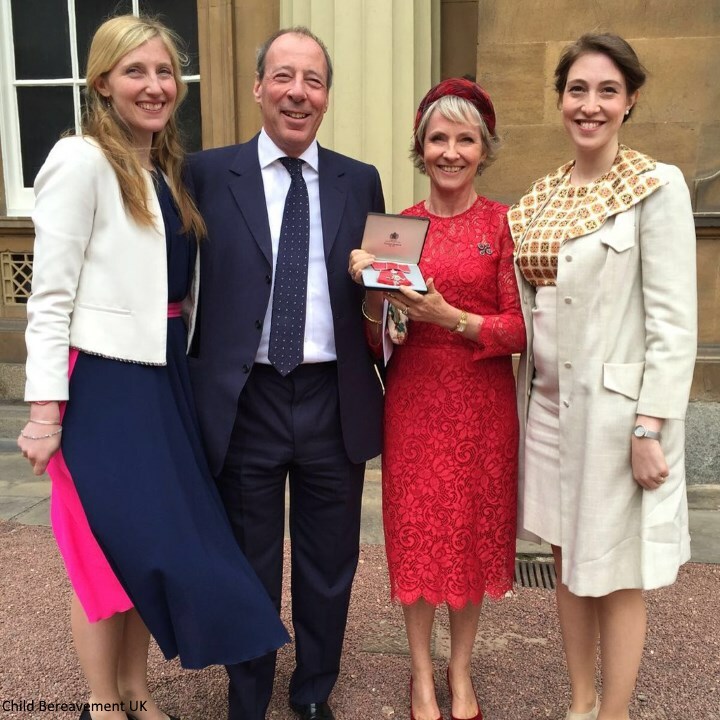 Mrs Samuel - a psychotherapist and counsellor who founded Child Bereavement UK of which William is patron - said: "It felt very different because it was recognition for the whole organisation. So I felt a bit shaky. Being in the palace, it's the whole system and tradition and pageantry. It's very moving." Below we see Julia Samuel with her family outside the Palace. I couldn't help but notice she was wearing her chic red lace dress from George's christening. William also presented a CBE to actress Imelda Staunton. Afterwards she said: "We did have a nice chat about what I do and that their children listen to me because I've done all of the Julia Donaldson books, The Gruffalo and ten or twelve others, and they listen to them in the car so they know my voice." You can read the full story at the Express. We'll be back with our remaining tour polls next. Hope you all have a great weekend! I am very happy to see those jewels again! :) Glad to see they were not a loan. (I've heard that Sophie loans alot of jewels from them). Those jewels bring the look one notch up from her more normal look and shows the importance of this meeting while still keeping it to the casual look. I have to say, I loved Harry and Michelles less formal greeting. Those two are really hitting it of. I look forward to seeing them together more in the future as I assume that she won't just disappear after they leave office. I love seeing a peak into William and Kate's home! And even though it was drizzling it would have been nice for prince George to have greeted the couple outside...prince George hasn't been seen in anything but photos since last summer! Just saying a missed opportunity. I know know I can hear you guys going "but it was raining" but two seconds outside wouldn't have killed him! A missed opportunity for what, my goodness? As with any dignitary, the focus of the arrival is on the them, and not the host. That is what a courteous host does. In this scenario, it was absolutely appropriate for the adults to greet each other without a young child, adorable or not, monopolizing it. I honestly didn't expect to see George at all, and it was such a special treat to see him at home and in his robe, just like any other little boy. A photo op like this is what people have been asking for every time an official photo is released. There has also been concern expressed that they aren't introducing him to his future role. Well, here we have it, and it's not enough. I'm sorry but it just seems to support William's recent statements and the Cambridge's approach to maintaining their sanity. what a fast post Charolette!! this is an exciting time to be a Royal fan, with the tour and the Queen's birthday celebrations! I wonder what is for dinner?? I find it very surprising that they have Smirnoff vodka on the bar, you would think they would have Grey Goose or even Absolute instead!! How funny we all are! I found myself wanting to have a close look at all their photographs and paintings. But if we went into someone's house as a guest it would be very rude to go around closely examining everything! Maybe that is why they usually host more public events in the state rooms at Kensington Palace. 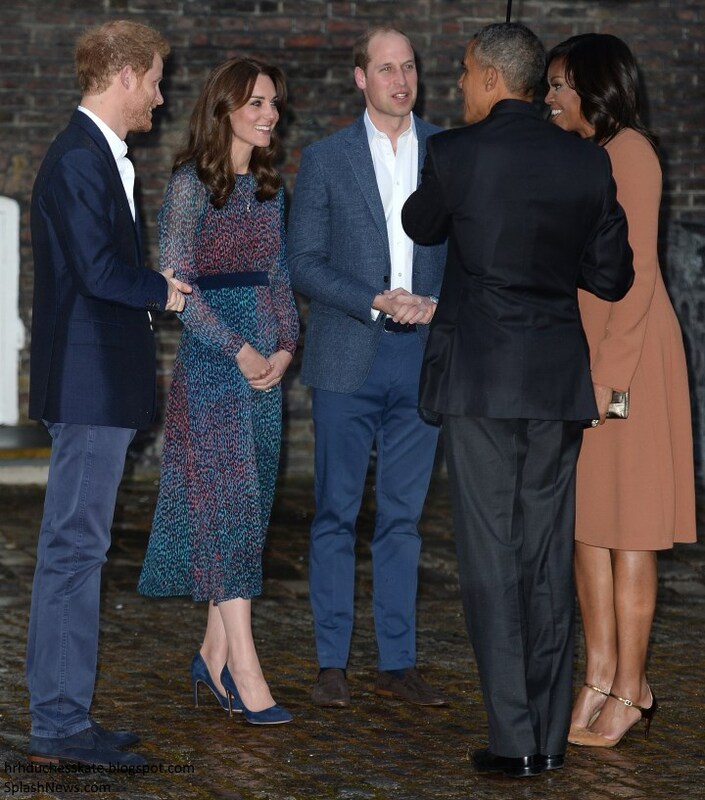 I'm so happy to see the Obamas meeting the Cambridges and Prince Harry :) Very nice photos! 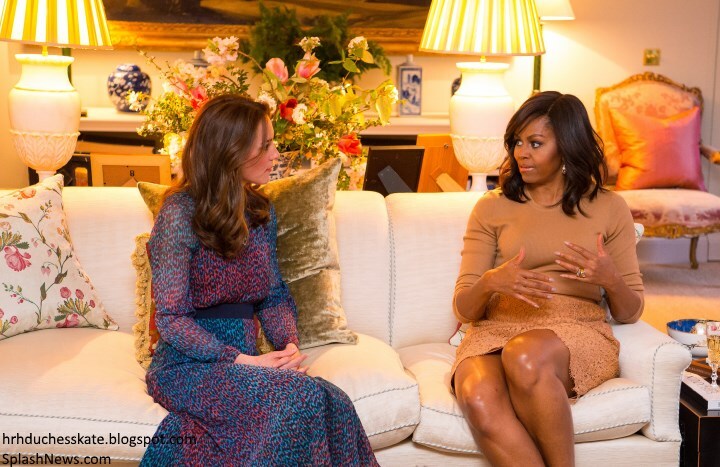 Kate looks amazing, i really like the dress (and I love Michelle's outfit!). I was wondering... does Harry live at Kensington Palace? Does he live in the apartment 1a too? 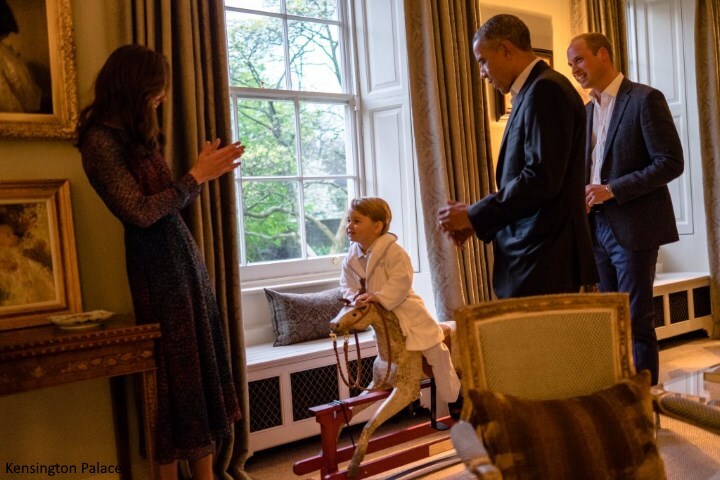 Was the rocking horse a present from the Obamas for George? What a busy week this was for royal watchers, i really enjoyed it! Thank you, Charlotte, for your incredible work here on this amazing blog. I love it! Prince Harry does live at Kensington Palace, but not in 1A with William and Kate, His residence is Nottingham Cottage on the grounds on KP. It's where William and Kate used to live. Nottingham Cottage sits across from Apartment 8 and 9 where William and Harry grew up. Harry lives in Nottingham Cottage (where W&K lived before this apartment was renovated). It's across from Diana's former apartment. Remember when the Queen visited "Not Cot" to visit baby George when he came home from the hospital? I like the dress without the belt best. Why does Kate add so many be,to to garments? Wish we could look more closely at the photographs on display in their apartment !! Lovely evening. 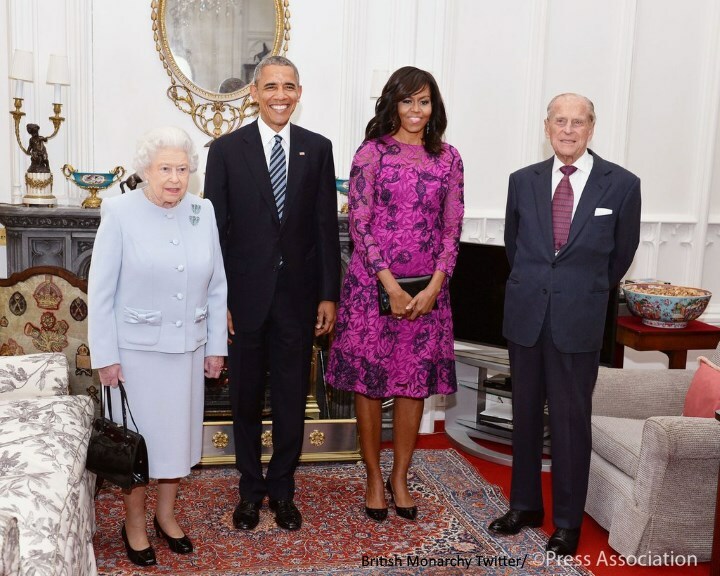 Do you have more details on the room Obama and the Queen are photographed in? It looks like any ordinary grandma room - with the TV so close to the sofa. So cute! Oh how I love seeing William, Catherine, & Harry host the POTUS & FLOTUS!! And seeing the easy interaction between POTUS/FLOTUS & the Queen & Duke! It all just gives me the warm fuzzies. Catherine's dress was sort of a nod to the US (& UK's) red white & blue! As an interior design junkie, I shot up in excitement seeing the snaps of Apartment 1A!! Is that a Lucite end table? I ADORE!! All in all, I sense there are some refreshing changes ahead monarchy-wise. Who was the commenter in a few posts ago who predicted that?? Do you think there is the possibility of William being king and not his dad? I agree - those shoes are so fabulous and Michelle looked great. I was surprised how casually William and Harry were dressed. They obviously all agreed to forego ties as the President was also tie-less Is that a tweedy jacket I see on the Duke? Catherine's dress is not to my taste but maybe that is "casual" for her. Still wearing those really high heels though. Eventually she will have to decide between style and comfort. The Queen now opts for comfort but imagine the fuss if Catherine suddenly appeared wearing lowheel patents! Seeing the Duchess standing with the others she doesn't appear to be all that tall. Maybe it is because the Queen is so tiny that we think that Catherine towers over everyone. Prince Harry lives in the much smaller detached cottage that William and Catherine used to occupy. It would be just a few minutes away from them in the same complex. Interesting to see their furnishing tastes seem to be a mixture of traditional and quite modern. No doubt they have access to royal family heirloom furniture and paintings etc but the modern pieces would be their own purchases. Dozens of family photos seem to be a family feature too. My thoughts exactly! I LOVED her shoes. They balanced that careful line of being interesting and stylish without being over the top. Annette, funny you mentioned height. When I first saw the photo of W&C, POTUS & FLOTUS the first thing that popped into my head was "four tall people"! So somebody at the PR department did convince William that he needs some good publicity. Otherwise, not in a milion years I could imagine them letting press in their home and in their much and well protected privacy. Even if press means Chris Jackson, I suppose. Lovely home, but not expected less. About her dress, I am on the fence. Another busy pattern for me. I loved seeing inside their home. I was super shocked but super delighted that Prince George was there. He looked so cute in his robe, pajamas, and slippers. He looked like a tiny little old man :) That IS a complement. He is ADORABLE!!! First thought: Michelle is so tall, Kate looks sono tiny by comparison. Second thought: Kate looks so Classic but a Little old-fashion. Michelle is definitely trendier! Super mega Excellent post!And soooooo fast! Charlotte who is this Omid Mio Scobie??? I notice a lot of rwtweet from him, is a normal person or a journalist or a super royal fan?? or maybe all 3!! What a wonderful day for President Obama and his lovely wife Michelle. It made me very happy to see that the dinner this evening with William, Kate and Harry was informal. They look great sitting in that beautiful apartment, chatting away! So glad to see Bo, the stuffed dog, that the Obamas had given George before. And can you imagine George, in his robe and pajamas, waiting in the hallway to meet them? I can hardly stand the cuteness that must have been! Love Kate's look tonight. I think she looks beautiful! I sure would love to take a tour of Apartment 1A. Isn't it gorgeous? Oh my! Thanks Charlotte for the speedy post! There home is lovely. Formal, yet very much a warm home, and it makes this royal fan very happy to see it. Lovely photo's. I know this blog is all about Kate's style, but my first thought when i saw it was, what is Michelle wearing? The outfit is very "Kate". I wonder if Michelle is wearing a British designer. Harry looks handsome as ever, I guess the beard is there to stay. Gosh I'm so going to miss the Obama's when they leave. I hope that the Obama's and the royal family keep in touch after he leaves office. I think there is a strong bond there between the five of them. They all seem made for each other in my opinion. I am going to miss them also, as warm caring people, not politicians. I am not into politics. They are real and down to earth, not phony baloney. And Presidrnt Obama has such a sweet sense of humor. He really does Anon 22, and i also agree with your comment as well Victoria. I haven't seen no other president have such a close relationship with the royal family as i have seen with President Obama. He and Michelle seem like very warm hearted people. I wonder if Michelle gave Kate any advice on raising kids in the spot light. I hope too that the Obama's will keep this friendship going. She looked amazing, i'm bery fond od this choise. Oh my - that interior decorating is not at all what I expected, and definitely very different from my own taste! It is obviously very formal, which I can understand, but it also looks very old fashioned, with a weird upholstered thing (ottoman? table?) in the middle. I also feel that the transparent table is very out of place next to the antiques! Still, very interesting to see. Even if I love Kate's clothing style, we have opposite interior styles!! Thank you thank you Charlotte! I have been checking your website all day! I think the Duchess' dress is lovely and how nice everyone is so casual. Wish we could have seen George in his pjs but still feeling very happy they let us have a peek at their apartment. So I retract my complaint about George not coming outside to greet the Obamas because they released pictures of the meet and greet! He looks soooooo cute in his little robe! Ok. It's official. I love George! ditto, Lella, ditto, ditto, ditto. He could not be any cuter. Lovely photos and great to see inside the house but I wouldn't be surprised if a couple if the rooms have been decorated specifically for official functions only and they're not really used much. I would expect their main living areas are much more relaxed. What an incredibly exciting evening. Both couples look so good together and you can tell they share a warm friendship. What a great historic night for the TRH to host the POTUS and FLOTUS. I love the casualness of the evening for all involved. I am hoping that you will also be able to identify and add to the post what Ms. Obama is wearing. Kate looks very pretty in this dress. It is quite lovely on her and compliments her very well. I love the accessories that she chose and that she added the belt. I'm glad the tanzanite jewelry received another outing. Such beautiful pieces. We have an LK Bennett store near where we live so I shall have to cruise by and see if the dress is still in stock. A very lovely look. The pictures of George on the horse and meeting the Obamas on twitter are delightful and I'm sure you will be adding some here as well. He definitely stole the spotlight of the evening. The next superstar was Apt 1A. I am so glad that we were able to have inside pictures of the room. It was very elegant and modern. I remember articles saying that Kate decorated in creams and neutrals. It is very stunning and those stories were definitely true. Such a cozy atmosphere it gave. I am sure there will be analysis of all the pictures both family and paintings that were there. Overall I think it was a great night and a beautiful engagement to end the week on. Thanks Charlotte for your fast and speedy post. The really interesting part of this evening is that we get to see INSIDE 1A!!! Nice treat and almost as exciting as Christmas morning. I've been wishing for a glimpse for a very long time and did not realize that we would get one today. Yay for the Obama's visit! have worn in my twenties. However, the pictures of the drawing room makes up for any and all sartorial disappointment. What a week of royal cutie pies! George in his slippers and his belted rope! Mia with her great granny's handbag! The future king of England meeting the President of the United States in his pj's!! I CAN'T EVEN!!! TOOOOOO much cuteness for the eyes! Like most moms, I firmly believe my two boys are the cutest boys on earth, but MAN does Prince George give them a good contest! Lol That tot is very, very adorable - half of it is his personality shining through! Love this! That's exactly what I say about my boys too! LOL. My little guy William (George's age) is learning to shake hands, too. It takes so much emotional stamina to take a stranger's hand and look them in the eye. Good training W & K! He won't be President of the United States when George is king, thank goodness! So wonderful to see the Cambridge's home interior. Very elegant, understated and tasteful. I would have expected nothing less! Just love it. And George is just as cute as can be. Love the graciousness of the British. Thank you so much for this post. Look forward to other events of this type. It was a huge step for William and Catherine to allow the press to take photos. Thanking THEM! If they read this. Oh where to begin??? I am so glad the Obamas have had a chance to visit and dine with HM and the Duke of Edinburgh. I really got a kick out of Prince Phillip driving them back to the entrance. The informality and friendship is lovely to see. I really love and appreciate what President Obama had to say about HM. I believe she is a real and rare jewel to the world. The gift they gave was wonderful and I'm sure one HM will enjoy looking back on with fond memories. Our nations do share a tight and unique bond. As many times as I have been to England, it almost feels like a second home to me and definitely has my heart. The British people are always warm and friendly and you can tell the warmth and friendliness extended to the President and Mrs. Obama, as well as past presidents, from HM and the Duke of Edinburgh. Off to dinner at Kensington Palace... As with the luncheon earlier in the day, the warmth and friendliness was also displayed with William, Kate, and Harry. I love the informality of their dress and the chat in the Drawing Room prior to dinner. How lucky of them to get to meet Prince George and what a treat for him to stay up a bit later to meet them too. 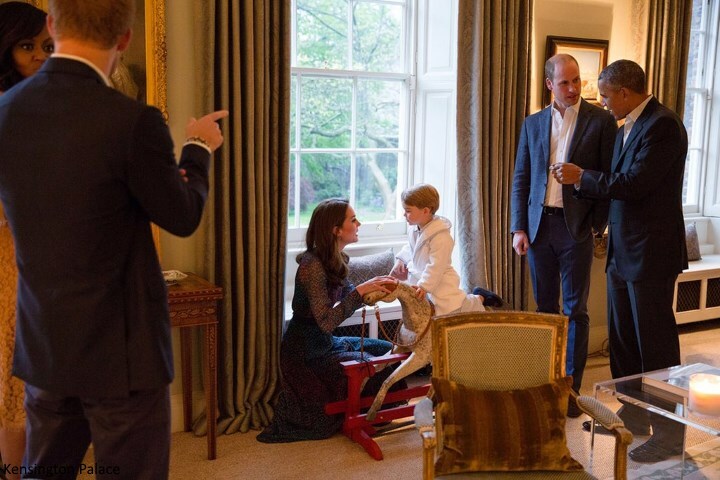 I do believe the rocking horse pictured behind William was the Obamas baby gift to the Cambridges after George was born. What a nice gesture to have their gifts out for George and Charlotte to play with. To me it seems like a relaxing dinner with good friends which is so lovely to see. I know with Harry around there will be a few laughs. I hope it was an enjoyable evening for all! Fashion.... First, Michelle Obama looked fabulous! I think her choices were spot on and perfect for both lunch and dinner. She is a beautiful woman! The men looked VERY smart too. Kate was beautiful and beaming in the "Addison" dress and a style that is "very Kate". Everyone looked great! I LOVE Kate's jewels! Tanzanite is one of my favorite stones and the setting for the necklace and earrings are both gorgeous. LOVE! Another fabulous day for Royal watchers and for the Royal family! Charlotte, thank you again for all your hard work the past couple weeks! Have a relaxing and wonderful weekend! I think my post was delayed a bit in coming up because the photos had not been updated. OH MY STARS! Prince George in his pj's is absolutely adorable! Something so unexpected to see yet so wonderful. The future King of England meets the President of the United States in his jammies. I absolute love it! The pictures are just precious. I absolutely love the shots of mother and son. Daddy chatting with the President, Uncle Harry chatting with the First Lady, and mommy's undivided attention on her adorable son. Thank you Charlotte for the close up of the moment. Thank you William and Kate for giving us a tiny snapshot into your home and evening with your guests. What a brilliant PR move and one that I imagine is greatly appreciated by many. I hope the evening was wonderful! We are very, very appreciative. What a lovely surprise. I didn't think we would see photos, especially of George. Meeting his first foreign Head of State at not quite three and doing so with aplomb is quite a serious first engagement. Love Catherine's dress and Mrs Obama's---though her dress seems a little short. Interesting to see their drawing room--very elegant. Doubt the children play in there too much or the pale carpet would look a little different. "Daily Mail" report that they were loaned staff from BP---but I take anything they report with a large helping of salt. Nice to see the younger generation taking an event like this. Thanks for a very quick report. Kate looks beautiful, I love the dress. Great color and very feminine. Wonderful! Everyone and everything looked both cozy and splendid! BTW-it's not just the horse. 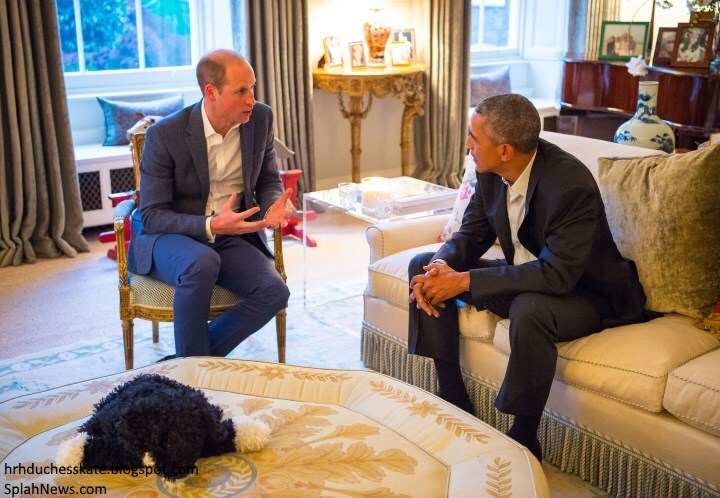 That stuffed animal doggie in the living room ––a replica of Bo the Obama's dog–is surely a gift to George from the Obamas. 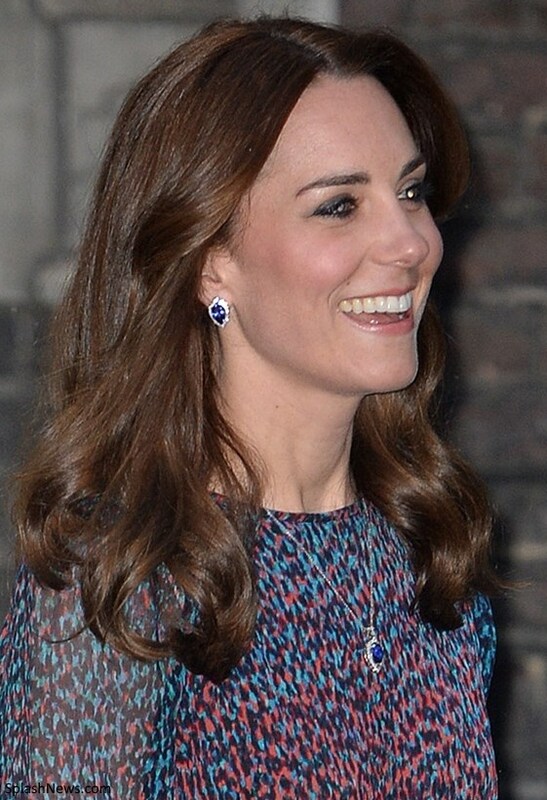 I love the pendant and earring Kate wore, as well as her entire outfit. Thank you Charlotte for showing the pic from last year when she wore the same jewelry. For some reason, the navy ensemble she worn then is my favorite outfit she has ever worn. A nice casual dinner amongst friends, for William, Kate and Harry it seems. How fun. How heartwarming. What nice memories. I wonder what they had for dinner and if was served with a butler or whatever or just their usual cook serving the dinner. I noticed a little bar in the corner. I wonder if William served as bartender or if the butler did. George waiting in the entry to meet them is the icing on the cake. That and the toys in the room. what were those toys anyway? I would love to know the origin of Kate's Jewelry. A $16,000 necklace is nothing to sneeze at, nor are the earrings. Any price info on those? Not my favorite dress for Kate. Seems we have seen that silhouette a lot recently and that type of small print. Standard fare. It was just okay. She looked beautiful anyway. I agree with President Obama, the Queen is a real Jewel to the world, and one of my favorite people also. Loved the seating mix up as they left for lunch and the fact that Phillip wanted to drive. I have a feeling that President Obama and Michelle had the funnest lunch and dinner today. When will we see William and Kate again? Thanks for your fast update on all things Cambridge. What a lovely inside view of William and Kate's London home. A real treat tonight including a sweet George! Forget politics now, they look like old friends meeting. I think both Obamas have an affinity for young people, a focus which President Obama considers to undertake post his presidency. Harry and Michelle both have shared their activism on behalf of military families. Harry might have visited them at the White House more than ones than William. What a beautiful mocha ensemble dressed by Michelle. It is dinner time too, mocha mousse and coffee-cappuccino please. Beautiful shoes by both ladies. Her skirt complements her host’s taste for lace dresses. I wonder if Michelle wore the purple dress for Pop singer Prince’s favorite color and many peoples’ favorite song, Purple Rain / rested yesterday-RIP. She had been actively interested in the entertainment industry. I wondered the same thing about Michele's Obama's color choice in her dress. NOBODY, I mean nobody, outshines Michelle Obama, no matter who is being photographed. (And I don't mean that sarcastically). Your eyes are immediately drawn to her. She always stands out. Her clothes always stand out. I love my Michelle! I disagree. Kate out shines Michelle by a mile. She does not always stands out. But you are entitled yo your own opinion. And I do live in the U.S. I will take Kate over Michelle any day. Liking someone much, and being a fan can sometimes affect our ways of expression. IMO, Michelle Obama is not necessarily about outshining. She can be amazingly thoughtful of the audience she connects, balances the topic of her speeches and subject matter with shining confidence. Fashion wise, at times she is photographed off Air force One back to the WH, looking like the everyday person, comfortable in whatever average she wears. For a woman as FLOTUS who has no precedence to compare to, she had been confidently daring to dress her own choosing, but not necessarily the classic norm style all the time. She is alternately comfortable being herself at times with no makeup and no fancy hair style. She seems to connect with all kinds of people; knows place, time and purpose. She is an example of one kind of a lady. People of all walks matter especially in America, and I believe, like her or hate her, she has inspired many people. She had played an outstanding role by the side of the President. Kate is another kind who triggers some kind of nostalgia either of story book princesses and/or college loving couples. Among many other things, a follow up on the workings of a relationship, her place in the history of one of the longest monarchies which still keeps going on, how she is able to lose weight fast after child birth, how she answered to the destiny she either found, or went after. She is obviously as competent, and if not better than your typical model image. She knows time, place and purpose too. I believe Kate’s shine is an ongoing novel, right when you were about to put down the book, something new happens. This is one of those times including other quite important turning points. In the end, one does not out shine the other. We can be happy we are all enjoying their similarities and differences in our own time. I believe both have inner strength, intelligence and qualities beyond the exterior. Both of them are a definition of their own times in a different context and on public stage. I am from the U.S. too and I totally agree! Kate rules! I absolutely love this photo that will become historic. The future king and the President!!! Thanks a lot for this gorgeous post, Charlotte! I agree. This will become and iconic photograph. OMG! Is it only me, or does anyone else feel the ground shifting beneath our feet? WK&H Hosting The President of The United States for Dinner; We got to see Photos 'Inside" Their Kensington Palace Home... We got to See Prince George in his Pajamas & Meeting The President & Mrs. Obama..... Wow! Wow! & Wow! They have been listening to feedback. Obviously. Look at all these changes. AND William also did Investures today. AND those interviews yesterday? There were two photo sessions with the Queen for George. Kate present at both. Charlotte on the Queen's lap, holding a toy horse? Birthday luncheon and dinner. Now a dinner for the President of the United States and the First Lady inside their private apartment??? Then George in his pajamas and little man robe shaking hands with the President to thank him for the toys? Harry added into the mix. HalleluYah. With all that going on, I wonder if the butler who was at their front door is a regular member of their team now. My guess is yes and I have a feeling he might be trained as a security person also as he mans the front door. Kate shouldn't, nor should William or Maria. A butler would be necessary. And someone to serve lunches and dinners. It would also be my guess that Apartment 1A at Kensington Palace in London England was the most secure building in the world for those few hours given all the security measures photographed in the media earlier. They do look like old friends meeting, 15. Actually I meant to write mocha mousse cake. Mousse with coffee-capachino? nay! It sound silly but I wanted to go to Starbucks. I can imagine how advertisers figure out commercials. Marketing can be some interesting game in a way. I have gone to stores which products arrangement "speak" buy me, buy me, buy me. Be ware! what is going on in that store, means their marketing strategy had worked out, if they had drawn the attention of especially conservative shoppers. Oh my goodness thank you for being so fast! I have been procrastinating all day waiting for these photos and they were so much better than I anticipated! I LOVE that we got to see the picture of their house and George meeting the Obamas! It is so, so interesting to see a glimpse of their real lives. Is it common to have interior pictures like this? I imagine it must be awkward to have a small cocktail party with two other people when there is a ton of press in the room? Or were only a limited number allowed in- George doesn't seem scared of a crowd. So fascinating! According to the White House pool report, one photographer was allowed inside KP for a "few minutes" to take "photographs of the group having cocktails before dinner." At first I thought it was likely Pete Souza but I'm hearing it was Chris Jackson/Getty? Not sure. I'm sure this is a more formal room that they use or intend to use for these kind of events, not their everyday sitting rooms. Nice touch to bring out the gifts. Camilla and Charles allow a lot of events to be photographed inside Clarence House, the Queen has also been photographed with public officials in her various homes, most recently I think was her sitting room at Windsor Castle. They'll stay there till POTUS leaves, then leave with him. The President flies in a helicopter that is uber, uber fortified. They always have a decoy helicopter that is in the air at the same time and then they have a third aircraft also in the air with air combat soldiers accompanying all that. This was all in the paper today. His limo is a fortress, called "The Beast", a real James Bond thing. It even carries pints of Obama's blood in case he needs a triage transfusion and a direct secured frequency line to the Pentagon. And, he had about ten cars full of security personnel and soldiers in his motorcade today, and armed motorcycles flanking him, and heavy swat teams around the the route perimeter. And those are just the ones we know about. All they were missing was a huge, vulnerable, press corps. Thank God. Perhaps you can understand better now why they chose to limit the media in certain areas today. For the record Rebecca, Obama is getting flak in the US for the cost and purpose of this trip, at least the news I follow :) The cost to the taxpayer is astronomical and no one seems clear what the diplomatic necessity is! I thought about all the helicopters this morning with the president and didn't hear one complaint about them using it when they had plenty of time to drive from London to Windsor and back. Wonder what this 4 day trip is costing the U.S. taxpayer. I bet a lot more than the Cambridge's week in India. we finely get to see apt 1a what a treat.the decore is beatiful and along with elgent homey. 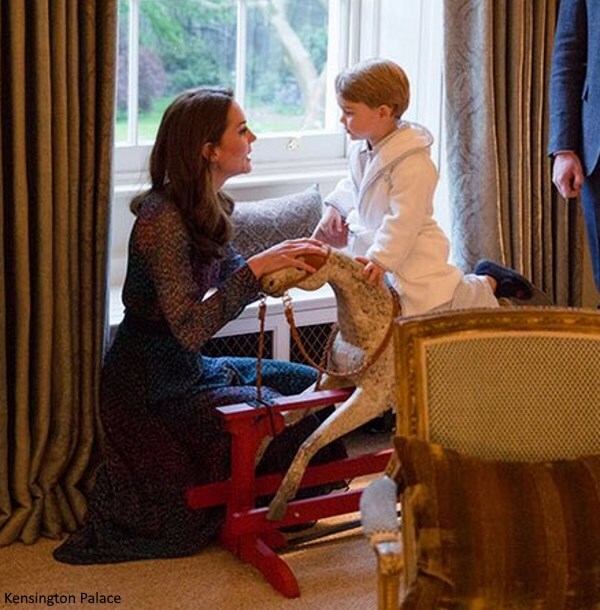 prince george is just adorable in his pjs and robe,i think it was charming on his little rocking horse. i love the padded table in between the sofas.kates dress wat pretty but the jewlery was stunning. i think the dress would have looked much better without the belt. Also, do we know the Source of Catherine's Tanzanite & Diamond Jewelry? Gift from??? Private Purchase??? Oh & BTW.... Charlotte You Rock! :) You leave Everyone Else "In The Dust" With Your Quality & Lightening Speed Reporting! Huge Thanks! What a wonderful post - so many details to devour in all of those photos! World leaders, royal families and the entertainment industry did, and will always have its admirers and critics. When it comes to politics, government systems, leaders, media and the general public, matters have to be within certain perspective. There is a side of all icons, leaders, fashion-style and their stories which can be interesting. There is only so much time enough to get a grasp of the daily news let alone vitriol. Vitriol comments can be read to have an idea of general opinion now and then, not all of them, and not on daily basis. This blog typically gets a lot of favorable posts for W&K as well as logical debate on media, duty, style and personalities. I would rather check out news on them, read posts and be informed on life and style subjects here than read the vitriol somewhere else. It can be insane at times. Personally I have opinions on politics both good and bad including on the Obamas. How much politics can you discuss at all situations? It is election year in USA and a very heated and unusual one. It is as much about party and presidential nomination favoritism for the up coming election even more than the distaste for the Obamas. It can get too much. In some cases, not monitored, trolls get paid to influence sides. I have stopped paying too much attention to that. George in his pjs! I just saw it!!!! 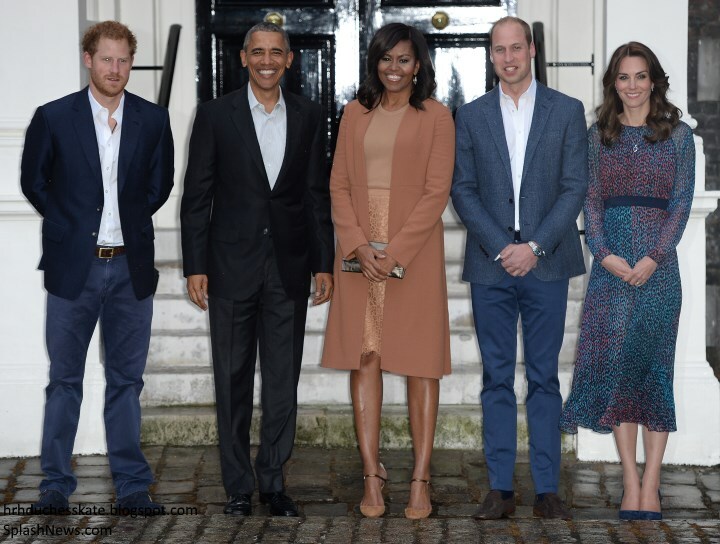 As a citizen of the United States and also an Anglophile too, it absolutely has made my day to see the Obamas get to spend quality time with members of the royal family. 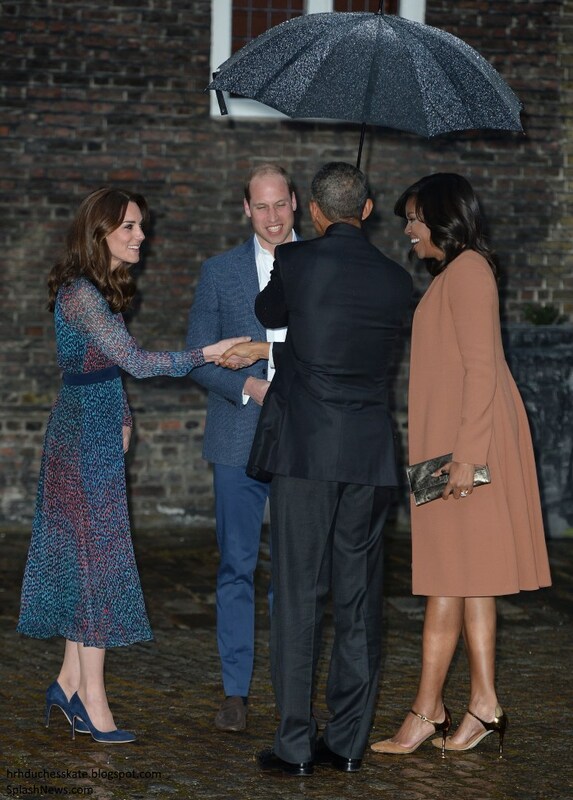 But the best picture has to be the Obamas meeting George. I love how they knelt down to his level and that he was wearing his pajamas. What a precious moment. I can't stop crying, actually, because it is so very genuine and special. In those pictures, they all just seem like long-time friends. The apartment exudes so much warmth and comfort, and so do the relationships they share. what a great day! I love being a royal fan, and this whole month has been AWESOME!! I love the pictures of Prince George. how adorable is he??? What surprises me that in the back ground it shows their bar, and on the bar they have Smirnoff Vodka. I am surprised they are not drink Grey Goose or even Absolute! The photos are amazing, thank you, Charlotte! I would never have thought we'd get to see Prince George with the Obamas. He is so cute! I wonder who was more thrilled :). The Obamas look younger than I expected. And Prince Philip is really incredible, driving them himself! OMG! Little Prince George in his bath robe... how cute! He looks like a little man! The mother-son moment photo could be cropped and framed. It is exquisite. 21:51, that is amazing. Thank you for enlarging that Charlotte. That is simply awesome. I am 100 percent sure the person who tweeted the comment was joking. Rebecca I saw one person tweet that, Niraj Tanna, and another correspondent at the Sun wonder where their "vice-grip on privacy" went. And I agree with Sarah that I think Niraj's comment was tongue in cheek. So a tiny, tiny fraction of the media. But both are valid questions/opinions/comments as it is such an unexpected turnaround from the Cambridges normal behavior. To be honest, I was stunned when we saw the first photographs from the courtyard, I couldn't believe they had allowed photos at their front door! So I understand the surprise, I think everyone here if they're being honest would admit this was very unexpected. As the person tweeting it was Tanna and the one retweeting it was Richard Palmer I HIGHLY doubt it was in jest. Am not Sarah, they are going to do anything to degrade the Cambridge's. I to am more than sick of them. Charlotte is a much better "reporter" than any media representative. No, Rebecca, you are not overreacting. Saying that about George is sick, really nasty. yuck. I agree, Rebecca, and I don't think you need to apologize. Exactly right...the journalists and "fans" want more, W&K come through, and it's still not recognized or appreciated. May I add the word miserable to my recent "fickle" observation? ;) And not for one moment do I buy that this is humor; it's more like bitter sarcasm. Claudia, when have they hosted a foreign dignitary at KP? I'm not aware of a previous occasion like this so it isn't so much about a "vice grip" as it is circumstances. C&D did plenty of hosting in their day, but I'm not aware of the boys saying hello in the PJ's (at least not in photos that were shared with the world). I will say it yet again. "The Gold Standard of Journalism"
I only bring it up again as a contrast to the garbage we are hearing again. Their comments about George did it for me. It is simply enough already. @JWhatling it's an absolutely staggering decision in light of the privacy argument normally wheeled out. Game on for a few guys I think. More... They are annoyed because these picture will be the front pages instead of the pictures they took outside. And I can understand that annoyance. But seriously, there are always things that can one-up their pics and bump them of the front page! Sigh. This "Bentley of Blogs" would not exist without the media. Charlotte herself would admit that. Where do you think she gets most of her photos and information? I don't understand the media bashing from people who devour every photo or bit of information about Kate they can get. My only intention here on this post was to compliment William for allowing these lovely photos to be taken and shared! But I think any reasonable person can see why William's own press corps might be put out a bit, it's such a contrast from how they're normally treated. And the British press are the ones who invest in covering royal engagements, trips etc on a regular basis. Pete Souza isn't going to show up to photograph William's next conservation speech! So I get it. I am not bashing the media. And I am thankful and appriciate their position in the covarage. I am just bashing their whining. Claudia, have you seen the latest character assassination in the DM? It's directed at Kate and is beyond disgusting. Even if some journalists disagree with terms set by KP, etc., there is absolutely NO excuse for this. The tour was successful and they did a wonderful job of representing the Queen. They returned to celebrate the Queen's birthday. Photos were released. They host the Obama's at KP. And yet the more they do, the worse the media is treating them. Do folks not see this? Claudia, you put up a valiant fight! Rebecca, if you appreciate their coverage, imagine how you'd feel if they could cover more. Thing is I can appreciate restricting the number of press allowed inside this evening. You have a very small boy who might be a bit overwhelmed with a phalanx of cameras going off in his face. However, it's just an extension in the continuum of William and Kate restricting press access. So tonight, I agree it's a poor example to make. But it is indicative of their behavior. And George *is* their secret weapon! He is adorable and the entire world is swooning over him tonight. The Washington Post called him the most powerful two year old in the world! If this was Jason Knauf's attempt at stopping the bad press it was an excellent distraction. What a treat to see inside their home and discover their style of decoration. Prince George is just too cute for words :-) !! Okay I know Im chatty on this post but I have a question? Is it just me or does anyone else tend to avoid wearing necklaces with a dress with a high neckline? Also, I am totally being a creeper and looking at the photos inside the drawing room and believe I spotted one of kate that must have been taken in 2006 at the van custem wedding! I was looking at the photos also Sarah. Nevermind it was from Lara Parker Bowles' wedding! The paintings on the wall are most likely from the Royal Collection. Not just you, Sarah...I thought the pendant was too long for that neckline. Can't feel too negative though, with George in his jammies and pics of 1A!!! So surprised and hoping it's the start of a new direction for KP. First thought, very few people make W & K look less than tall. What a change from last week where they were always the tallest! Katie's outfit didn't make much of an impression one way or the other, but the style of dress suits her impeccably. Michelle's outfit is a 10 out of 10. Wow. I am impressed, especially given what we saw what she wore last time she was in Buckingham (her clothes looked nearly otherworldly with that fantastical colour combo and sheen). Kate, newly married, was then wearing a neutral. Now Michelle is wearing a neutral. I also noted the lace. Maybe Michelle is wearing the lace as a nod to Kate's penchant for lace. Wish we could look at those family photos with more clarity. . . The shoes are art on their own; add complementary plus of her wearing shoes beautifully, the look is well married. Yes! Those shoes! I really wish Kate would do something similar in the shoe department. She totally has the ankles and legs to wear any style...why not branch out? I'm sure some photos were planned, but I wonder if the past week with the Queen's birthday celebrations influenced William to release more tonight? This is such an extensive peek into their lives, complete with George in his pj's... so very different from the almost staged pics we usually see. William must have noted this week how important the historical aspect of documenting the Queen's life was, and maybe wondered what his 90th birthday film would look like? Not to mention what a historic moment this is for George, every time he meets a US President as an adult this will be shown with the commentary "the first time the Prince met a sitting US President he was not yet 3, and ready for bed!" So it would seem to me (I'm hoping) that William is recognizing that he and his family are not actually "normal", they are part of history and much of their lives has to be documented for the historic record. For instance, every POTUS has an accompanying White House photographer at all times for that very purpose. I thought myself that the pendulum would swing for William after the Queen's death, as he saw the enormous public reaction and watched her life story played out in news clips round the clock. But he may have had a taste of it this week. Because this is a remarkable departure from their usual modus operandi. I know there is a temptation to see a more deliberate ploy here, but I'm going to be cautiously optimistic until they prove me otherwise! So I will say: Well done William, lovely images captured for the history books and shared with the public, as they should be. 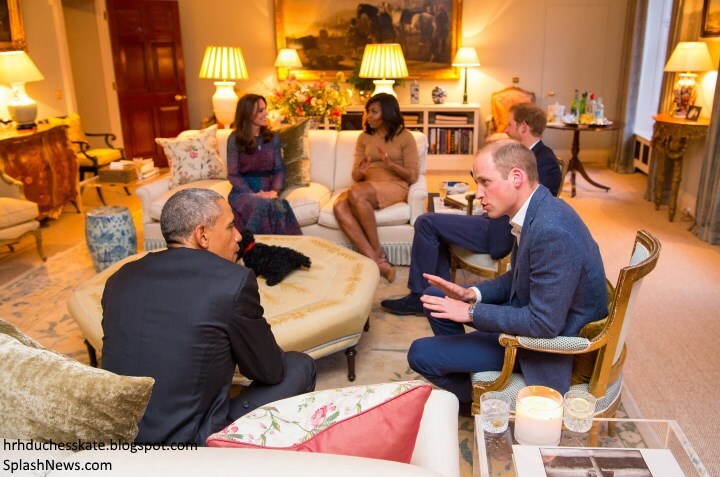 I think William felt he had to release photos of meeting the Obamas in the apartment. After all, cameras are allowed into the Queen's apartment when she plays host to them. Shame it didn't happen before. Interesting thoughts. I am SO glad he decided to do this! It is so wonderful to see a glimpse of their lives like this. And what photos! Absolutely agree Claudia. I was shocked they had released so many photos! Especially those which show their home, AND Prince George. Very atypical, but let's not look more into it and hope for the best. I am sure they are documenting things all the time. Look how much of the Queens early life only comes out in bits and pieces over time. Oh my Prince George looks like a dapper young gentleman! I should imagine that the Press will have had to be excluded from Kensington Palace because it would be totally impractical to have dozens of photographers inside that room. So it will have been organised to have one or two taking photographs and an arrangement to share the photos. However the UK news media don't like that sort of arrangement as they think it impinges on their rights. A bit sad really - just imagine Prince George's reactions if it had been organised differently. I have noticed that the Scandinavian royals also carefully control any photos taken in their private quarters. Yeah, and the Swedish royal family has Kate Gabor who takes 90% of their official pictures. The white house as well has one photographer following the president (Have had for the last 50 years or so). The Queen has one cameraman filming all her engagements and has had the same for 20-25 years. But somehow William and Kate having one person taking the pictures and then fairly distributing to the reporters are "restricting the press". Regarding all that security, 23:08, my guess is that it won't be questioned the way precautions surrounding W&K's recent tour have been. :( Food for thought, eh? I love that PP drove the Obama's from the helicopter to the Castle. :) Perfectly normal, but it did make me smile. And did anyone notice Michelle's pose in the above photo with the Queen and PP? May I assume that no one is concerned about her not feeling comfortable or confident? I noticed that RF, but then I recalled how the Queen had put her arm around Michelle on a previous visit. Maybe she was uncomfortable being in an open area. They had intense security around for some reason. And to be clear, there is NOTHNG wrong with MO's pose here, I just pointed it out for the sheer irony of it. Just compare C and M handwise infront of KP. M looks confident. C looks insecure imho. It is not just the hands but the whole body. I was messaging with a friend in rural England today. I asked her if she thought W&K were slackers and she said absolutely not. She said as long as the Queen is alive and Charles is the supposed heir (her words) William is behaving perfectly correctly. She doesn't think though that Charles will be king for long or at all. She thinks the majority of ordinary Brits don't want him and esp if he wants to make Camilla Queen. Just an opinion from a Somerset "woman on the street"in her 60s but an interesting one. She also thinks the media are a waste of space. Valerie, I'm shocked!! ... I say with a wink and a smile. Loved the dress and bought the dress even though it's YET ANOTHER BLUE dress! Cutest natural pictures of everyone in KP!! The Obamas are so cool! Loved the birthday greeting from the British astronaut, Tim, in the Space Station. There two Americans, two Russians and Tim, from Britain up there at the moment. oops. Charlotte, Kate is shaking hands with President Obama in that photo, not Michele. I think so anyway. He had his arms crossed or something because he of the way he was holding the umbrella. I might be wrong about that though. Haha, yeah Anon 23.47. Look like they played a short game of "Hand shake twister" :P A common sight when 4 or more people are gonna shake each others hand. It is excellent you posted it here for the record. That was exceptionally nice and memorable. I saw it in early news, rushed and did not even now he is from the Queen's own country. Is that what they were doing? 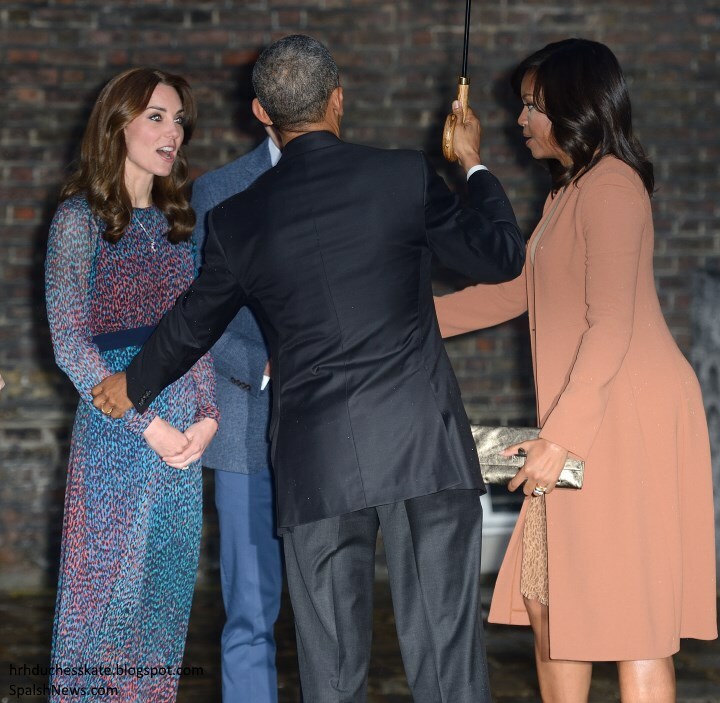 I thought Obama being left handed was holding the umbrella with his left hand; he was shaking Kate with his right hand. (William can easily be understanding of the left hand person's "normal" as well as "reverse" dealing with right handed people while both hands are busy at the same time. William ya didn't wear a navy suit! LOL Yay!! =D I liked the informality and I believe this is more their style (barring such things like a state dinner that obviously is far more formal). I think this is more their speed. I love that they, like many parents, let their oldest son stay up long enough to say hello to the guests (and thank them for his birthday presents). I loved seeing the inside of William and Kate's home, even though I dont believe this is a part of their personal living quarters. Wasn't 1A renovated to be where interviews and meetings like this take place? The public image of their personal home? I don't mind the separation of this - I tell myself all the time that there needs to be boundaries between work and home. The royals are doing this with apartment 1A. The photos of George are adorable and it would have been cute to hear him practicing saying hello president Obama. However, I think my favourite photo is the long shot of the group meeting outside. The colours of Kate and Michelle's dresses stand out against the dark brick wall and the large shadow (including the umbrella the president held for his wife) looks amazing. It may be a more "formal" living room, but it is very much part of their private apartment. I couldn't help but notice that it overlooks the private walled garden. I forgot to ask - did Kate where this much blue before the engagement announcement? I can recall a few outfits but the choice to regularly return to this colour seems like a deliberate effort to coordinate with her lovely ring. The dress came alive when she got busy with George. Its sheer, loose flow and length serves a good purpose for a comfort of a host in her own home. It blended with W&H blue, and stood out against the apartment mellow yellow lite and spring atmosphere. Some thought might have gone to Kate’s jewelry on top of complementing her dress. IMHO, it complemented a president who got elected promising to end the war in Afghanistan and tried, her set repeated here after that memorial in St. George’s church is a subtle message on political diplomacy. It was very thoughtful to have brought out President and Michelle Obama’s gift and introduce George to them and vice versa. George behaved real good. What a moment and lucky for all who were there and a part. You can't quite say it is another blue dress. It can easily become souvenir collectors item in its replica or the same one. Historical significance also defines fashion and style. Personally the motif is not my taste. The cut, flow, length and sheer is beautifully feminine. Kate used it purposefully here. The Cambridge's as a brand is so very recognizable all over the world; however, once their son Prince George is included it raises the recognizability to a whole new level. By the way, these pics hit social media in a volley that was quite noticeable. Much praise should be given to the planners on both sides for this visit of President and the First Lady to have Prince George be part of the photo-op. So many firsts happen this evening with Cambridge's hosting a head of state and said head of state, the President of the United States greets the host who comes out in his PJ's and robe--I am LOVING IT. Another first was seeing the inside décor of the Cambridge's apartment. Finally, I did not find anything wrong with the Duke driving the Obama's--of course it was all choreographed, besides the Duke is an excellent driver. ...and there you go again. The media are impossible, no matter what W&K do there will always be some for whom it is not enough. I agree with you, they are disgusting, and some of them are what is known as "yellow journalism". I don't think you can blame the British media for any reaction they might have. They have a job to document the lives of the royal family, it's not a lark, it's their livelihood. Some of them have been banned from official royal engagements, they've all been prohibited from taking photos of William & Kate and their children IN PUBLIC! Suddenly the US President is in town and a photographer is allowed into their home, to photograph them and their son in his PJ's! Face it, all of us were surprised by this. They are as well and I think if you put yourself in their shoes it's more than understandable. I'm glad William and Kate did this, but they do a lot overseas or for foreign visitors and I think they need to throw a large bone to their own press corps. Oh, I understand them! And I understand some of their thoughts. But at times I think some of them expect to much to be served to them on a platter. But not with the stepped up uber security that was present, overtly and covertly. The press Corp needed to stay away from this one. Heather I think ONE British reporter or photographer should have been allowed in to document the event as well. I initially assumed it had been Chris Jackson, but only Pete Souza, the White House photographer, had access. The White House policy is to allow a press pool with the President, with one representative from radio/TV/print. They are American reporters or photographers who disseminate the information to the rest of the press pack. Info from today's event for example can be found from today's White House press pool, the members change regularly. They cannot take anything they see or hear "exclusively", anything obtained from being in the pool has to be shared with all other media. While wider press follow the President as well, that pool goes in smaller, close circles where everyone can't fit! On Air Force One, in the motorcade, etc. Since this event was on British soil, at the home of a British prince and future Head of State, I think they should have allowed a British reporter or photog to report back to the rest of the royal press corps. I have no sympathy for the media whatsoever. They use and abuse every chance they can to get what they want. They traded in morals for money. If their livelihood depended on the gossip and doings of another's daily life, then they should have gone to school to get an education and do something better with their life. No pity for them whatsoever. Claudia, I don't know if you are British or North American but just as the American media do not "own" the President nor does the Canadian media "own" the Prime Minister or Governor General, the British media do not own the Royals. I have lived in the UK and have loads of British friends and family and for them the media's importance is more for footie scores and weather and local crime (and some unfortunately Page 3) and if there is a story about the Royals it is interesting but not mandatory :) Of course maybe they aren't representative of the majority but then are we? Charlotte if you're interested, Arlette Saenz with ABC shared the pic of George in the hallway when the Obamas first arrived. In some of previous posts someone has observed: "I'm boho-ed with this kind of dresses and prints". Well, that's what I'm thinking at the moment. And to me the Madison dress was better option. She does look lovely though and that shots of George in a a robe?! How insanely cute is he! And it was a great opportunity to get a peek inside of their Kensington apartment! Splendid decor, and right down my alley when it comes do daydreaming about interior design... I am so curious about their photos selection, I think I recognize what some of them could be... A shot of Kate from a wedding, years ago, I think it was that outstanding brocade cream coat and black and cream fascinator with some strings and feathers... I could be quite wrong, though.. They are a tall group! Yes, I noticed the same..odd to see Kate the shortest! Love Catherine's dress & jewellery! she's really rocking the midi trend so big in the UK right now. Michelle's purple floral dress is a miss, in my opinion. It just looked jarring & not a great colour on her, and didn't suit her somewhat square body shape. The tan outfit complimented her better in terms of colour but it looked kind of old fashioned, and the cut of the coat was odd. Little George - so very cute meeting Barrack and Michelle. The purple color didn't work for Michelle. And the lines of the dress didn't flatter either. It was all wrong for her. The beige was flattering in color but you are right, the cut of the cost was wonky. That purple dress dress was an $8,000+ disaster. Prince George is simply the monarchy's best and cutest case for existence. What a treat to be able to see inside Apt. 1a. I feel appreciative that William and Kate let us have a look. I wonder, however, if someone more in the know of how palaces are set up could tell me, would this be a typical living space that the family might kick back in the evenings and enjoy television etc.? Or is there apt to be another more private area where they hang out when it's just the four of them living their "normal" everyday lives? I suspect that this is a cozy-formal room for the express purpose of receiving visitors. In that sense it would be a public space within a private home. I suspect that they would have more casual rooms they would kick back and watch TV. This room really doesn't invoke popcorn and munchies or kiddies' toys. I suspect that "the world" was allowed inside exactly because it is private, not public space. I'm sure that is the formal drawing room for receiving visitors and not a place where William and Kate would actually spend time with their children. It's very impractical and formal for that sort of thing. I have a feeling Kate and William would never let their actual, personal living quarters be photographed. I am sure it will be part of their private apartment, otherwise you wouldn't have family photographs there. The reception they held before they went to India would have been in one of the state rooms in the Palace which is a very large complex. If you travel to London, part of Kensington Palace is usually open to the public. The private apartments are blocked off as quite a few members of the royal family live there, not just these three. No doubt W&K have a day nursery for the children in Apartment 1A which will be more like our idea of a play room. I think I read there are two kitchens in the apartment. One will be for their own personal use - the other one bigger for meals when there are guests. The extra staff from Buckingham Palace mentioned would be for providing this meal and serving it. I get the impression that usually William and Kate don't like lots of staff around and they supplement their own small staff when necessary. Quite a few of the more numerous royal staff during Diana's time have spoken up since then about things they witnessed and no doubt William from personal experience doesn't trust people to always be discreet. Just to add, I'm glad Harry was there too. I like how all three are a close team. What great photographs. Catherine looked lovely but I am not a big fan of the dress and agree the wide belt does not work as well with the high waist of the dress, the waist is high in the front, low in the back, always awkward to put a belt around that if it is not made for the dress with loops or snaps to hold in position. At least that has been my experience:):). The apartment is gorgeous and so fun to George. I'm surprised no one suggested that this dress might have been a backup for India and she pulled it out to wear because it was brand new. I'm sure she had several extras while planning her tour wardrobe. To all our British friends, after a post made by Charlotte, it seems an appropriate time to say "Thank You". For people who originally came from 2 countries and separated 200 years ago, one group saying they were essentially defecting and the other, I imagine, feeling betrayed, we have stuck together through thick and thin. No matter what war the U.S. has asked your assistance for (and we have been in many! ), your country has always stood by our's, unwaveringly, giving your lives for our's. I have always thought that was something precious and as a citizen of the USA, I feel grateful and thankful. It is not always clear if our country does the right thing or not but your country still offers unwavering faith. You are a precious and special relationship and I offer my most grateful thanks. Ok all you Royal experts on this site:) a couple of questions. First there is a video of the President and Michelle landing at Windsor and getting into the car, it looks like the female security officer helping with the car doors is one that has been on Catherine's security detail in the past? Second another site had a big photo of a man opening the door at Kensington Palace, does anyone know who he is? I'm back. I had to drop by and say that as a citizen of the United States, I couldn't be more proud that President Obama will always be the first President that met the future King, Prince George. I love all of the pictures but especially the one where President Obama shook that little hand. It's a good day! Sorry but I cannot join the Obama love fest, but prince George, w&k and their apartment I can definitely get excited about. Love Catherine's dress and prince George is just adorable. Looking forward to upcoming events. Well it has been a wonderful royal month indeed- a tour, interviews, the hint of an increased role for William and Kate, wonderful, simply wonderful photos of the children, and of the queen and Anne and the queen and the corgis/dorgis and now a glimpse of William and Kate's home and the absolute charm of little George. I love their sitting room, it is at once very elegant and yet homely too, a room where you can comfortably sit and chat - not as girly as Charles and Diana's flat was (although I loved it at the time - it does seem a bit much today) and not as grand as the drawing room at Clarence House - although I love that too. I had heard they were choosing pale colours - very much the thing now, and it sets off the grand paintings quite wonderfully, but it also is a private look which seems to suit this couple - colour says so much. I adore looking at the art in people's home - although I do try and be discreet - most people don't mind in the least or often are pleased - I know I am, since much came from my family. But this is very much a Julia room, except I do like a bit more colour - so I'm thrilled. It doesn't look either like some smart designer like Kelly Hoppen came in and did it up - that was what I was a little afraid of. With all that white, I do imagine George and Charlotte mostly stay in the nursery for their play - with those wonderful Chinese antiques too - and where is Mr Lupo? As I recall, the Obamas like dogs, I believe it is required that US Presidents like dogs (and there is a wonderful portrait of one of the first ladies with her dog - one of my favourites along with my royal favourite - the children of George III and their spaniels. So I'm still Lupo - should he appear, my month will be complete. That centre seat - I would call it a pouf but that is such an awkward word now - is very similar to what Charles has - I suppose a coffee table is seen as naff in royal circles - according to DM of late - so are pianos if you don't play, so let's hope someone does. In both cases I love the look but could never copy it - it would be covered with dog fur - since the dogs would never distinguish it from one of their baskets. But this room does show off what excellent taste William and Kate have. As for staff, I've heard that it is quite common for them to be loaned for occasions such as this - in fact, they can be hired in London, if one is wealthy enough. How grand that would be! Finally, what a splendid birthday the queen had and she wore one of my favourite brooches. 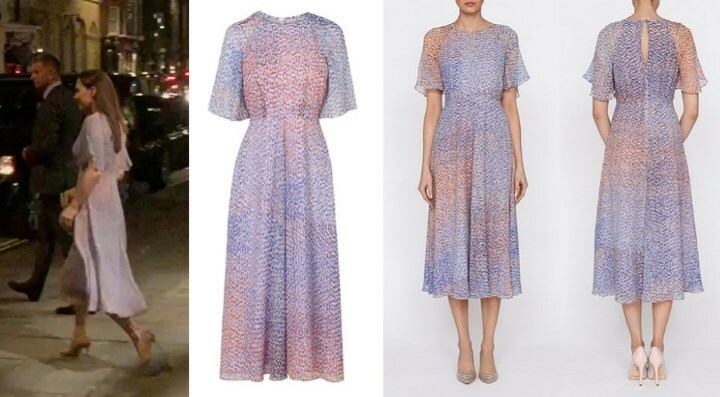 I thought Kate's dress might be the DVF - although she was pregnant when she wore that - somehow, a short dress doesn't seem as likely - look at that recent dinner when the queen stepped out. It is a quiet choice regardless - just right since the birthday lady should be the centre of attention. And I do think comments made in royal-friendly places such as blogs like this may be being heeded- we will never know but that is always why I do say what I believe. Charlotte does such a brilliant job - I really think William and Kate should hire her as their press advisor - although she is probably hiding under the dining room table at the thought of that! And weren't we thinking of sending a birthday greeting to the queen - it would have to be belated now! Thanks Charlotte. It was such a treat to see inside that beautiful apt. Prince George stole the show for sure. What a cutie. 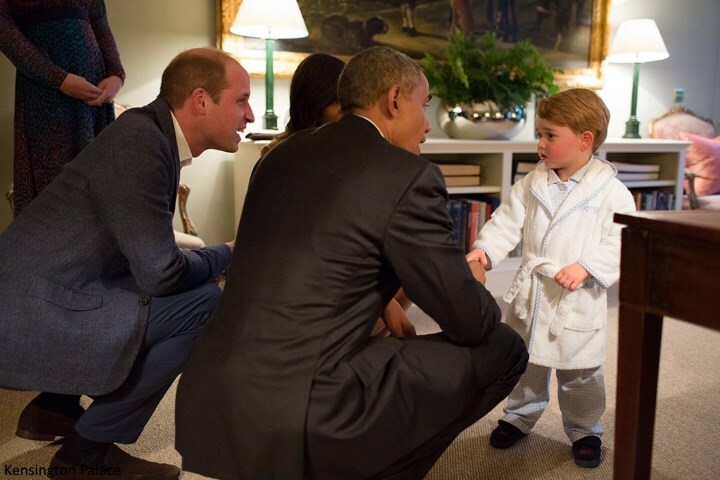 Historic picture the future king meeting the President of the United States in his pyjamas no less. Priceless. 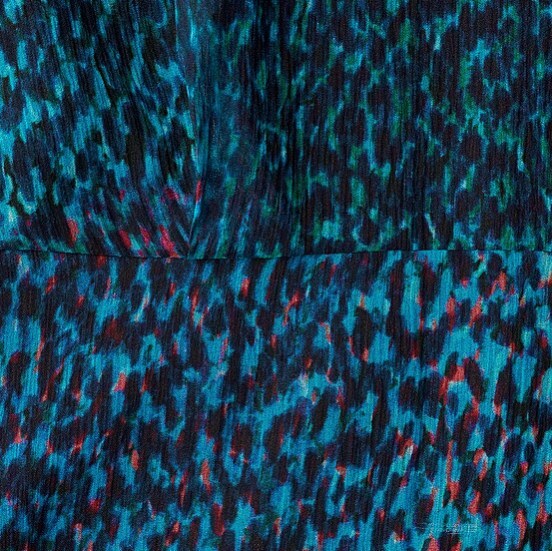 I'm very happy to see Kate continuing to choose a colourful, fashion-forward patterned dress now that she's back from India! Kate is shaking hands with President Obama, not Michelle. OFF TOPIC but I wanted to say I received the Monsoon wedges today Kate wore on her first day in India. The ones she played cricket in and did an obstacle course in.